The GolfNow VIP Trip Sweepstakes is ipen only to permanent, legal United States residents who are (i) physically residing in one (1) of the fifty (50) United States or the District of Columbia (excluding Puerto Rico, Guam, the Virgin Islands and other United States territories), and who are eighteen (18) years of age or older. 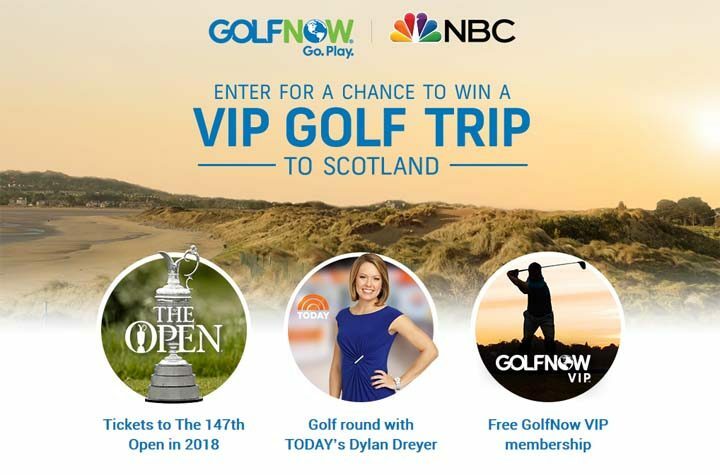 The GolfNow VIP Trip Sweepstakes ends at 12:01 A.M. ET on June 19. To enter, visit GolfNowVIPGolfTrip.com and follow the provided instructions to complete and thereafter submit the entry form. Limit of one (1) Website Entry and one (1) Bonus Entry, for a total of two (2) Entries per person. There will be one (1) prize awarded to Winner. Prize will consist of the following trip: Winner and one (1) guest will receive the following: one (1) year of a GolfNow tee-time reservation service VIP membership for Winner and Guest; two (2) tickets to the 147th Open Championship in Carnoustie, Scotland for two (2) days for Winner and Guest; one (1) round of golf for two (2) at a nearby Scotland GolfNow course with Dylan Dreyer for Winner and Guest; four (4) nights’ accommodations in Carnoustie, Scotland or vicinity determined by Sponsors in their sole discretion for Winner and Guest; a rental car for length of trip; round trip coach-class air transport for Winner and Guest from closest major airport to Winner’s residence to/from Edinburgh, Scotland. Winner or Guest must be twenty-five (25) years of age or older with a valid driver’s license from a U.S. state, and a major credit card to redeem the Car Rental element of Prize. If Winner or Guest is unable to redeem the Car Rental, Sponsors may substitute ground transportation at their sole discretion to/from Scotland airport, Scotland hotel, Event, and the Open Championship. Estimated Retail Value (“ERV”) of Prize is ten thousand four hundred twenty seven dollars ($10,427).